Welcome to The Clothes Spin, your go-to laundromat 22 miles near Bedford, VA area. We provide our customers with a clean and comfortable environment to wash, dry, and fold their clothing and linens. We offer a variety of washer and dryer sizes to accommodate your individual laundry needs. Is your dirty laundry pile turning into a mountain? Does your laundry eat away at your free time each week? Are you tired of waiting for your washer and dryer to keep up? If there’s one chore that never gives you a week off, it’s laundry. Luckily, we can help. 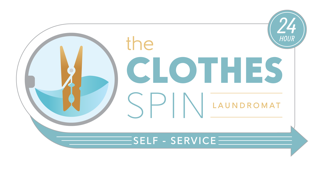 The Clothes Spin is a laundromat within driving distance from Bedford, VA that’s been locally owned and operated as the fastest growing laundromat in the area. We love being able to provide our customers with 24/7 coin self-serve laundry services that exceed their expectations. Whether you have just one load of laundry or everything you own is dirty, we can help. We’ve been proud to become the most popular laundromat. We’re open 7 days a week for your convenience. Our machines vary in size and accommodate individual and family-sized loads. We provide a friendly and comfortable atmosphere. If you have any questions about our laundry services, please leave your name and contact information. We’ll reach out as soon as possible.